An exhibition showing work of 7 artists completing their MFA at Wimbledon College of Art. 1. outside the bounds of acceptable behaviour. 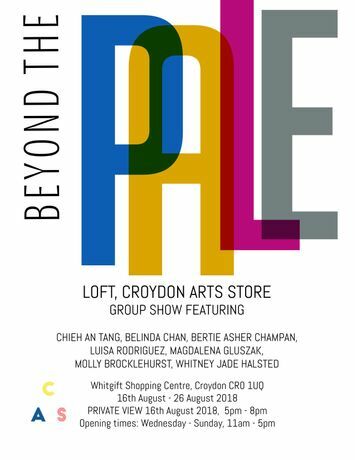 ‘Beyond the Pale’ is a group show that explores what happens when six artists from different cultures, background and beliefs congregate within Croydon Arts Store, with a local mission, bringing together shared purposes. A Lion with a kind heart once saw a Pigeon and an Eagle fighting. The Pigeon asked the Lion to save him from the Eagle. The Lion told the Eagle that he is prepared to pay any price in return for saving the Pigeon. The Eagle asked the Lion to give him the equal amount of flesh to that of the Pigeon’s. Agreeing to the Eagle’s condition, the Lion started chewing off his own flesh. After donating some of his flesh, he still found the Pigeon to be heavier. Finally, he surrendered the whole of himself for the Eagle to eat. That is the moment when both the Eagle and the Pigeon turned into spirits who appeared on the Earth to behold the extent of the Lions good heart. The Lion for his selfless good deed was rewarded with the most precious and magical gift, the reality that a world of perfect contentment exists. As artists, our common ambition is to tackle bigger universal issues and the placing of these to eyes of the local audience, tests how art can be of influence to future developments in the attempt to temporarily create a space not governed or dictated by any particular laws, but giving us the space to create them. In a world that holds peace and struggle, joy and sorrow, with different minded people and with different beliefs, ‘Beyond the Pale’s’ aim is to collectively showcase works, where each perspective is given equal and significance importance within a defined space that grants us the right to be free and express our individual ideals. Located within a shopping centre, an unusual yet unique place for a gallery, CAS is highly accessible by the Tramlink and offers a creative link for multicultural artists and their work to become an approachable form of art engagement for the general public and a platform to reach a wider audience, in particular the local community. B. 1988 in Taiwan, Chieh An Tang is an artist working with multimedia sculpture and is a MFA Fine Arts student at Wimbledon College of Art, University of the Arts London. 2011-2017, Chieh An worked as a florist and in 2013, established a flower studio. She majored in ceramics at the Da-Yeh University, Taiwan and graduated with a Bachelor of Fine Arts. Chieh An is currently living in London, UK. B. 1994 in London, Molly Brocklehurst is a figurative painter who explores ideas of memory, time and loss. Molly Brocklehurst is currently studying for an MFA at Wimbledon College of Art, University of Arts London. She holds a first-class BA (hons) in fine art and a foundation diploma from Leeds College of Art. She was nominated for the Aon Art Award Prize (2016) and has lately been shortlisted for the Dentons Art Prize (2018). B.1988 in Zimbabwe, Whitney-Jade Halsted is a London based artist whose watercolour paintings concern the development of contemporary social hierarchies and their relationship with the environment. Whitney is an MFA Fine Arts student currently studying at Wimbledon College of art, University of the Arts London. 2013-2017 Whitney co-founded, co-developed and co-established a private corporation dedicated to the conservation of wildlife in the remote region of the lower Zambezi, Zimbabwe and exhibits permanent collections of Whitney’s drawings, paintings and photographs. Whitney is a 2012 Fine Arts graduate of the Ruth Prowse School of Art, Cape Town, South Africa. She currently lives and works in London. B.1993 in Hong Kong, Belinda Chan is a London-based painter, who is currently a MFA student at Wimbledon College of Arts, University of Arts London (2017-2019). She holds a Bachelor degree in International Business and Anthropology from the Chinese University of Hong Kong. Her current work explores and expresses experiences and emotions through intuitively-imagined landscapes. B. 1992 in Tegucigalpa, Honduras. Luisa Rodriguez is a multidisciplinary artist working between painting, sculptural installations, and design. Her most recent works seeks to highlight underlooked elements of the urban environment and their relationship to ideas of replacement, value and inequity. She graduated with Bachelor of Architecture from her hometown and made studies abroad of Fine Arts in the Santa Fe, NM and Madrid. In 2016, she was granted a scholarship to complete a Post Graduate Diploma in Florence before starting her MFA Fine Arts at Wimbledon College of Arts in 2017. B. 1990 in Poland, Magdalena Gluszak is an artist incorporating painting, drawing and photography in her work. She explores notions of uncertainty, which influences the transitions of the images throughout the process of intuitive construction of abstract narratives in her work. Current MFA Fine Arts student at the Wimbledon College of Arts, University of The Arts London (2017 - 2019). She graduated from the Arts University Bournemouth, 2014, with a BA (Hons) in Photography and Central Saint Martins, London, 2011. Recipient of two Emerging Artist Grants from the Elizabeth Greenshields Foundation, Canada (2018 and 2017), and a winner of a second prize in Lifestyles category, Bar - Tur Award Annual Photography Competition, 2011. She lives and works in London, UK. 1994 London born and bred, Bertie Chapman is an artist exploring the uncertainties of growing and living. He is fascinated with acrylic paint and uses the medium to enhance the life paint has as it dries - cracking, shrinking and leaving a trail of where it once was. He collaborates with the medium and makes paintings oozing with life with abstract subjects from the ups and downs of his life so far.